Hurricane Irma caused an estimated $10 billion worth of damage in the Caribbean. Officials are starting recovery efforts on the Caribbean islands devastated by Hurricane Irma. 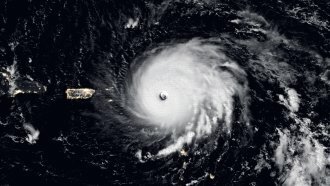 The storm made landfall as a Category 5 hurricane on the small island of Barbuda on Sept. 6. Irma then passed over other islands, including St. Martin, the U.S. Virgin Islands and Cuba as the storm moved toward Florida. Authorities have confirmed dozens of deaths in the Caribbean, including at least 10 in Cuba. Irma's estimated to have caused at least $10 billion in damage across all the islands. The prime minister of Antigua and Barbuda says 95 percent of the island's buildings are damaged. Many parts of St. Martin, which France and the Netherlands each own half, are now also largely uninhabitable. Both sides have increased military forces there as reports of looting increase. Related Story Do We Need A Hurricane Category 6? French President Emmanuel Macron is expected to travel to the island Tuesday for the first time since Irma hit. As of late Sunday, more than 1,200 Americans were evacuated from St. Martin, and that's expected to continue Monday. Cruise lines, including Royal Caribbean and Norwegian Cruise Line, also sent ships to help evacuate people who couldn't leave before Irma hit. Officials were concerned Hurricane Jose would hit the islands Irma already pummeled, but Jose passed north of the region over the weekend.